A report by Localytics has found that over 12 times the normal amount of activations occurred over the holiday weekend alone. A new report by Localytics claims that over 12 times the number of iOS devices were activated over the holiday weekend, December 23rd - 26th compared to previous weekends since Thanksgiving. It's probably because the jailbreak untethered came out yesterday and everyone upgraded. Read the dates dipsh*t! Yday aint even in the question! 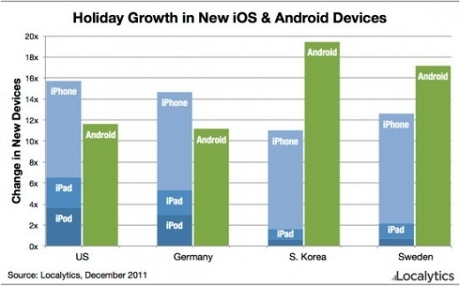 No wonder they dumped iPods for Christmas and went for iPhone launch.